According to Derek Gehl (Entrepreneur.com’s “E-Business” columnist and the CEO of the Internet Marketing Center), a really easy, frequently undervalued strategy for getting traffic is giving away free content. The buyer’s journey, especially in the industrial sector, has drastically changed. According to Achinta Mitra over at Industrial Marketing Today, most B2B buyers prefer to conduct research and purchase on their own — with access to a sales rep via phone or live chat only when needed. In other words, your site visitors aren’t going to pick up the phone and contact your sales department. They are going to do research and make their purchasing decision before making a phone call — if they make a phone call at all. Giving away free content is like laying breadcrumbs on the path for potential clients to follow right towards your product. The more content you give away for free and the better the perceived value of that content, the more breadcrumbs your potential clients have to follow straight to your product solutions. This chart from ON24 illustrates this new buyer’s journey and how you can use content marketing to reach them early in the awareness stage. The sooner a potential client discovers valuable content, the more aware they are of your business and products, the more likely they will be to purchase from you. Industrial Manufacturers have a wide inventory of content to share that their potential clients need: component part models. As we mentioned in a previous article, engineers download millions of component part models every month because they need these digital components to complete their designs. When they are looking to specify a component into their design, they visit (and revisit) manufacturers who provide digital parts on their websites. These digital component part models make their jobs easier and their designs more accurate. Now imagine if those same engineers were able to download component part models from your website. They enter in their email address and are immediately able to download the model they need. 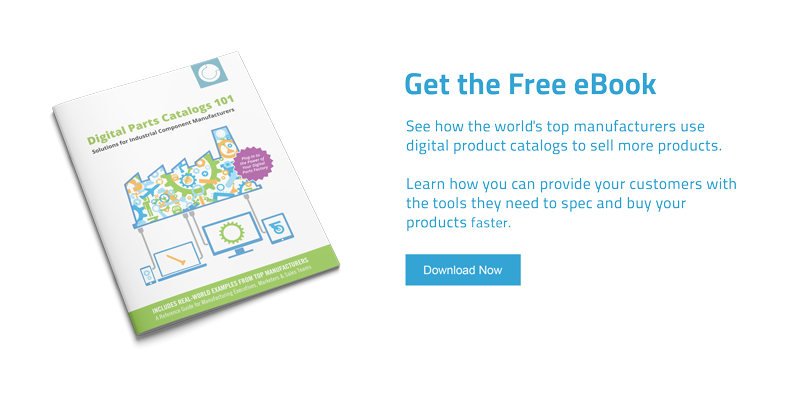 When manufacturers provide customers access to their digital component part models, they create an entirely new stream of sales leads which boost sales opportunities and the bottom line. Engineers register their email address with the manufacturer’s site in exchange for access to the parts catalog. It’s a win-win situation for the client and the manufacturer. The engineer gets the digital component part model for their design and the company gets a highly qualified lead for their sales team to engage with. Giving away your component part models in exchange for an email address will prove to be one of your greatest source of valuable leads, even more so than paid advertising. The more value you give to potential customers — and give for free — the greater the return you’ll receive in way of leads that turn into sales.